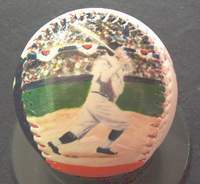 This Legends Hand Painted Babe Ruth Baseball features two paintings of the Bambino. 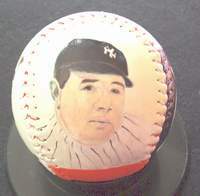 Side one is a close up painting of the Babe. 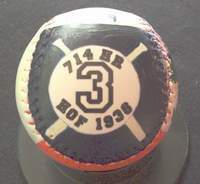 Side two is Babe Ruth's classic swing that won him twelve home run titles. Side three shows the Babe's famous number "3". 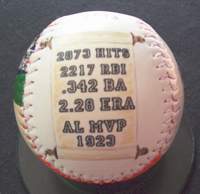 It also lists his home run total of 714 and the year he was inducted into Baseball's Hall Of Fame. Side four has a hand painted scroll with some of Babe's most impressive stats. 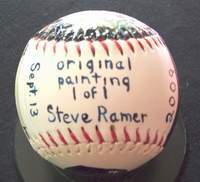 And side five has my signature and the date this Legends Hand Painted Baseball was completed. You'll also see "1 of 1". This means that this is number one of only one created. This is a one of a kind piece of art work. There will never be another exactly like it.